You must have to know about the performance of your System time to time. And check which programs or components are working slow or working not appropriately. And which processes are taking more load ad memory on CPU. There are many tools for monitoring but I am mentioning the light weight and best tool for your need of monitoring System’s Performance. 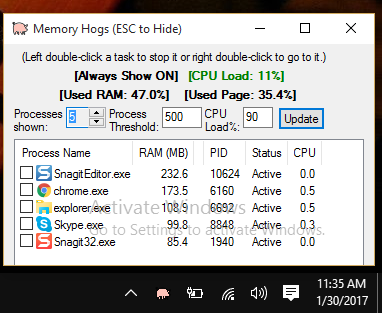 Memory Hogs is a freeware tool that helps you in monitoring your PC performance. The Windows built in tool Resource Monitor is also present for wide monitoring but as it is very heavy and lots of things are displaying which makes user confuse. So Memory Hogs is for those users who want light weigh resources and simple and easy in use tool. This is portable version and you get zip folder on installing. Extract it and install it into your System. When you install it a window of Memory Hogs is displayed which shows you all the current processes running on your System. It will display the top 5 processors and their CPU load and process threshold. It will display the tray icon that process isn’t responding if that particular process is reached at certain threshold. This is very helpful for user. He can close that program to make CPU’s load less. Just right click the process and make it close for good. On Right Clicking the icon from System’ tray, and go to “other alerts”, to check its more options about alert and you can select any of them if you need them for your System. The Memory Hogs tells to user if following threshold or incidents occur. When a processor uses more than default RAM which is 500 MB the Memory. When any processor stops responding. When you don’t left with certain amount of free disk. The one little negative impact is that it’s all Settings can be edited in .ini file format. Which can be cause little problem when the program is send with all its documentation. But it not a big problem at all so can be negotiable. Above all, it is very handy and easy tool that is very practicable for monitoring your System’s performance. It only uses little amount of your System’s resources and provides all its Settings and documentation in an .ini file. So choose this tool for good monitoring of your machine.